On Friday, June 22, the winners of the 2018 AZ Awards will be revealed at our gala. 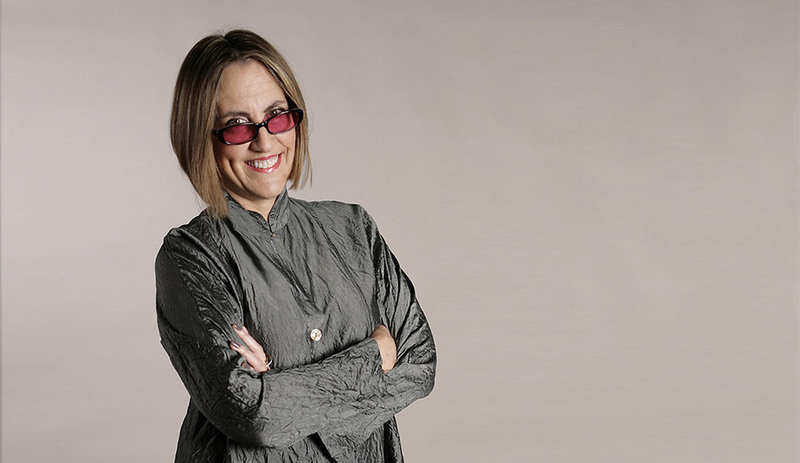 Joining in the celebration will be Azure’s Guest of Honour, celebrated Dutch architect Winy Maas. Here are 10 blockbuster projects by his firm, MVRDV. Winy Maas is a Dutch architect, landscape architect, professor and urbanist of international renown. 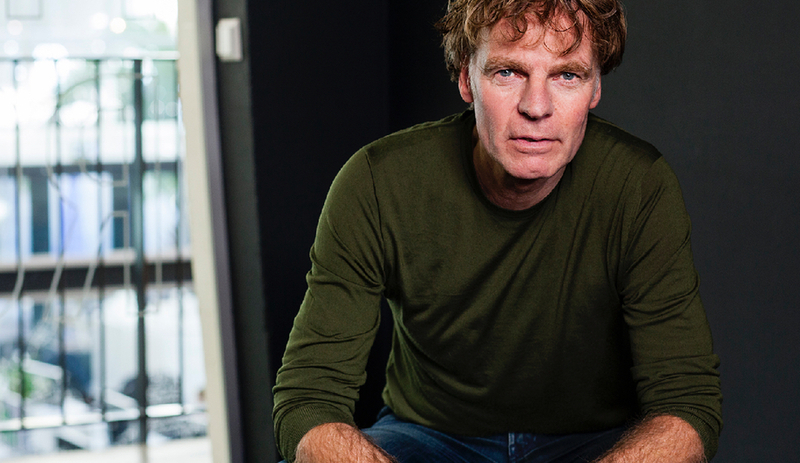 He established his Rotterdam firm, MVRDV, in 1993 together with Jacob van Rijs and Nathalie de Vries. In the subsequent quarter-century, the firm has innovated at every level, from experimental concepts (like Pig City) to city-changing installations (like Stairs to Kriterion) and transformative urban developments (like Silodam). The firm is celebrated for brilliantly reimagining existing typologies – from shipping containers to barns – and inventing new ones entirely, as it did with the much-adored Markthal Rotterdam. Maas will be the Guest of Honour at the 2018 AZ Awards Gala. Get your tickets now – super early bird pricing is in effect until April 30. To catch up on Maas’s extraordinary career, here are 10 iconic projects by his firm. 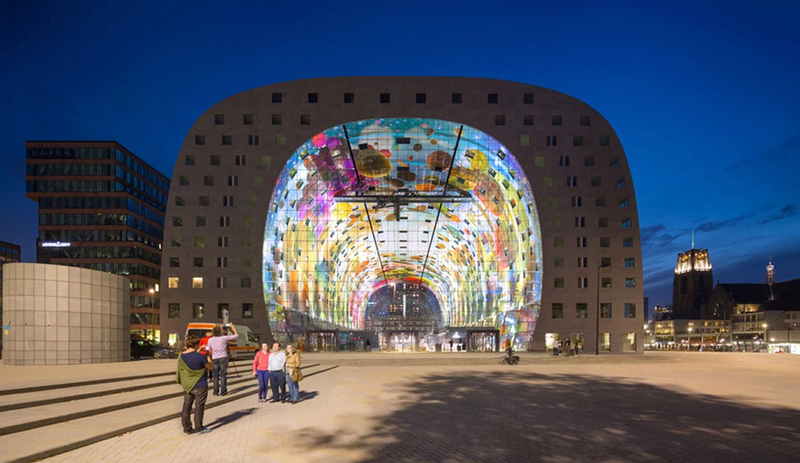 Completed in 2014, Markthal is an icon of Rotterdam – and an inspiration for any city seeking to reimagine the open food market. It represents a number of firsts: it’s the first covered market in the Netherlands – with a horseshoe-shaped roof measuring 20 metres long, 70 metres wide and 40 metres tall. 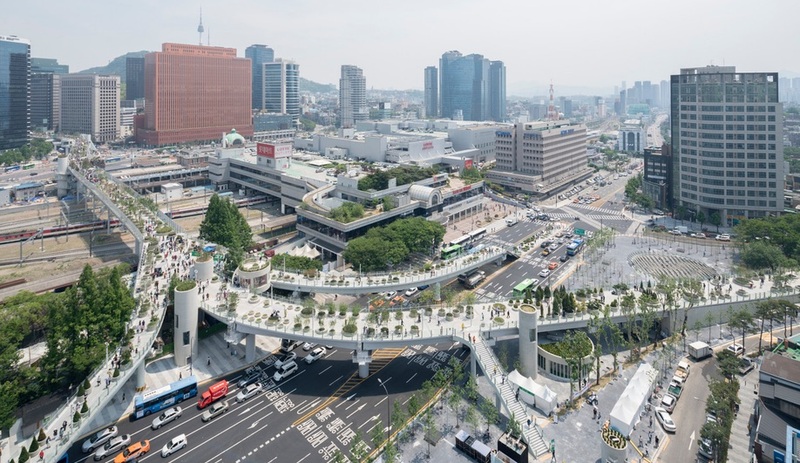 It’s also the first building to combine the mixed uses of housing (the apartments are located in the arch volume), a food market, restaurants, and underground parking. Finally, it incorporates an original and monumental artwork – the one-hectare mural Horn of Plenty by Dutch artists Arno Coenen and Iris Roskam. 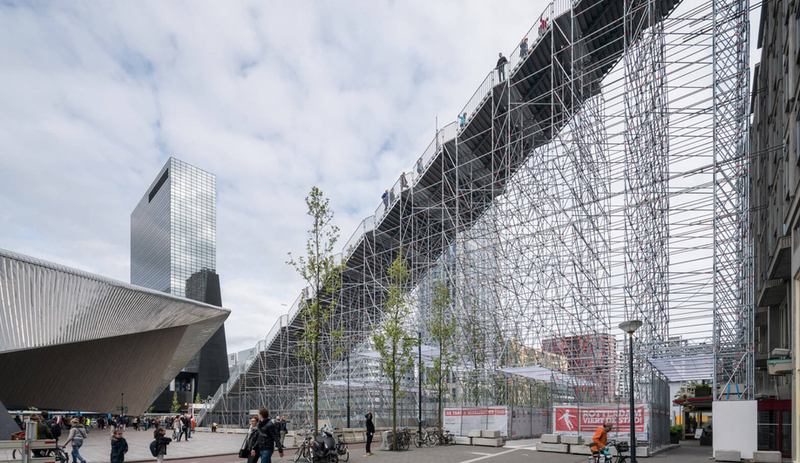 Another fantastic temporary project, this seven-storey, 29-metre staircase that went up in Rotterdam in 2016 had a deep connection to the city around it. It encouraged people to look at the constantly transforming downtown in a new way, as they climbed from the square outside Rotterdam’s central train station to the Groot Handelsgebouw’s rooftop, with its 1960s Kriterion cinema – reopened for the run of the project, along with a new temporary café and observation deck. As we wrote at the time, “[it] transform[s] the simple act of stair-climbing into an almost ceremonial procession.” The staircase saw much traffic in its limited run: An estimated 1,000 people per hour ascended the modern ziggurat. 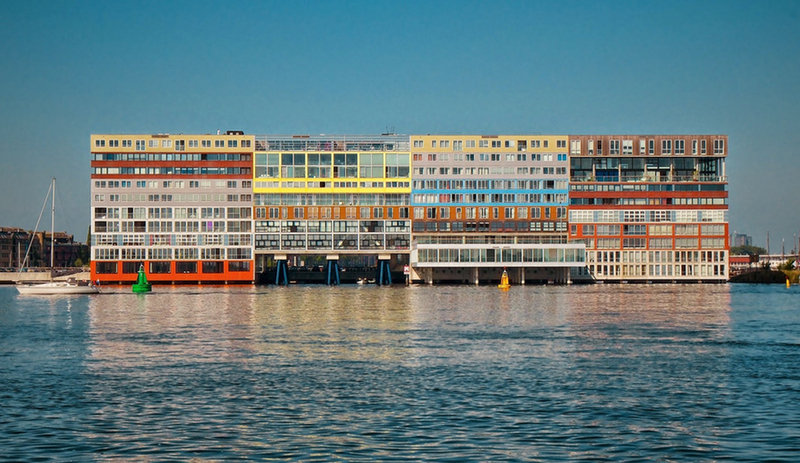 One of the earliest projects of MVRDV to garner worldwide praise, this housing development completed in 2002 captured the spirit of container architecture – its stacked volumes resemble shipping containers – but brought it to a whole new level. Like the Mirador in Spain, in development by the firm at the same time, the project experimented with progressive themes of density and mixed-income tenancy, in a single building that functions like a network of neighbourhoods. 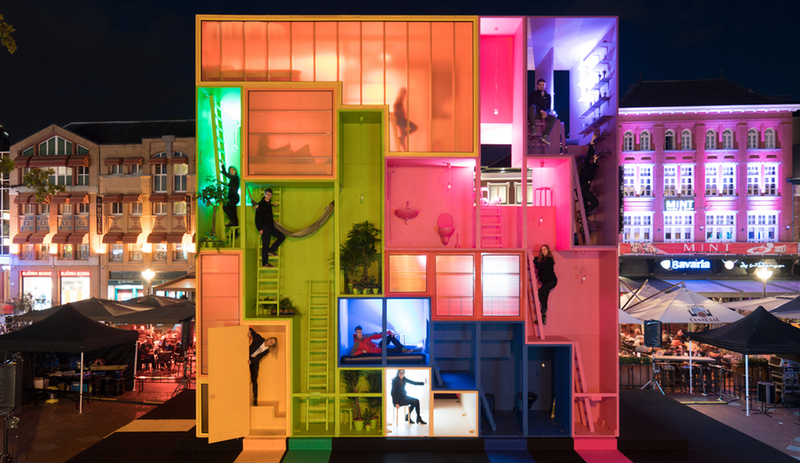 “The starting point for MVRDV’s design was a desire to accommodate a wide variety of homes, bringing together low-income families with elderly residents, office workers and artists,” the architects explained. The 10-storey block was part of the surrounding industrial area’s transformation and accommodated 157 homes, along with workspaces, commercial units and communal areas. 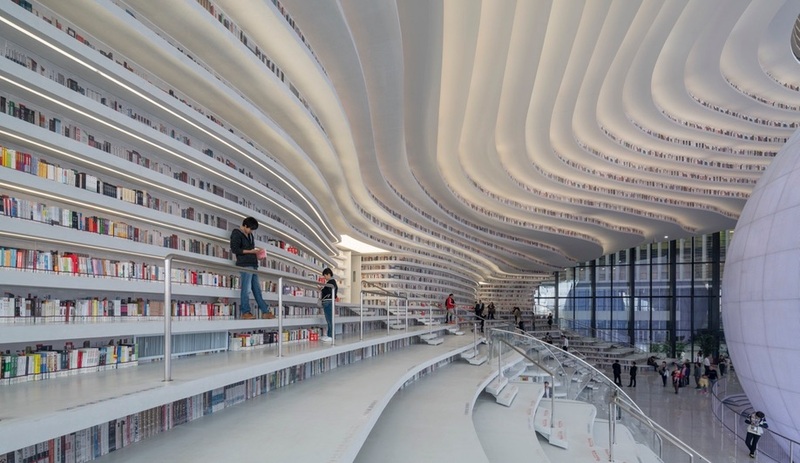 Before there was the book temple that is Tianjin and the futuristic façade library that is Crystal Rock, MVRDV created Book Mountain in 2012. 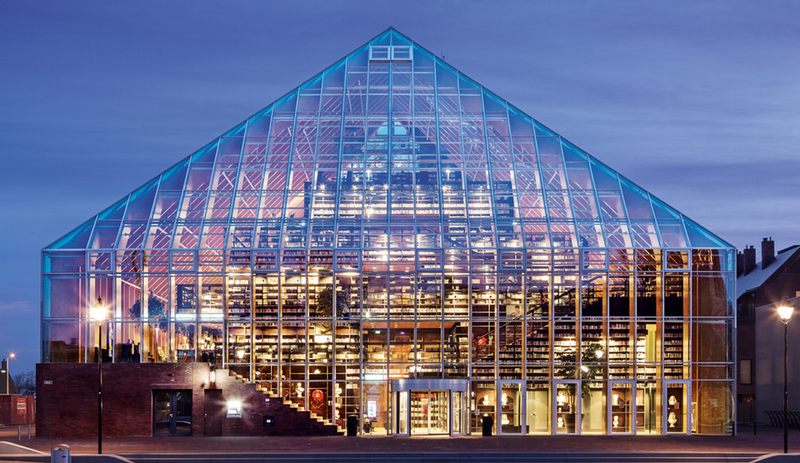 Situated in the town market square of Spijkenisse, the pyramidal library – with its 480 metres of bookshelves and reading spaces – stands as “both an advertisement and an invitation for reading,” according to the firm. MVRDV also designed the adjacent Library Quarter, which boasts 42 social housing units, parking and public spaces. In 2006, the philosopher Alain de Botton’s Architecture of Happiness book was adapted not into a film, as most bestsellers are, but as a series of buildings designed by world-renowned architects. Situated around the UK, these ideal dwellings available for anyone to rent through the Living Architecture website (an innovation that presaged Airbnb), promoting the spirit-elevating quality of great architecture. 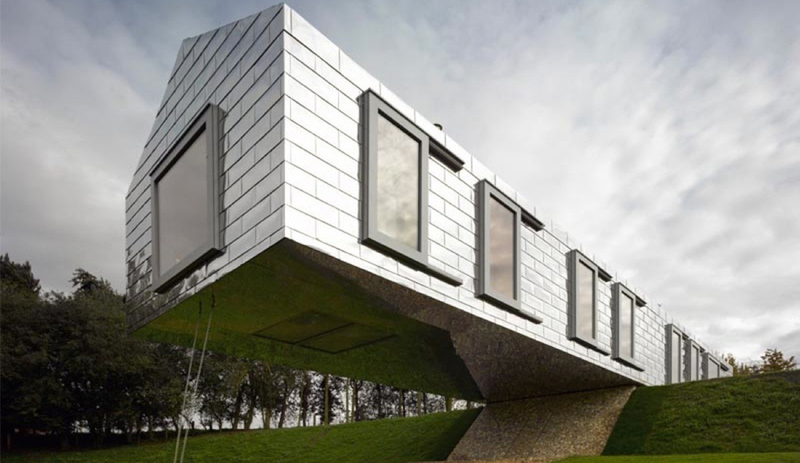 MVRDV created one of our favourite getaway homes: Balancing Barn, completed in 2010 in the English countryside. Its shiny metal cladding updated the barn aesthetic and its perch atop a hilltop created a 15-metre cantilever that enabled the most playful detail we’ve ever seen – a swing that hangs from the home’s archetypical frame. 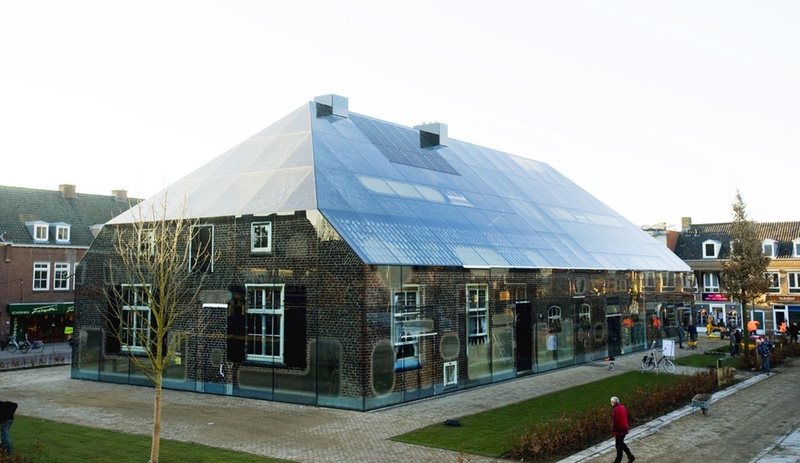 An optical illusion of a building, the Glass Farm looks like a traditional brick barn wrapped in glazing. 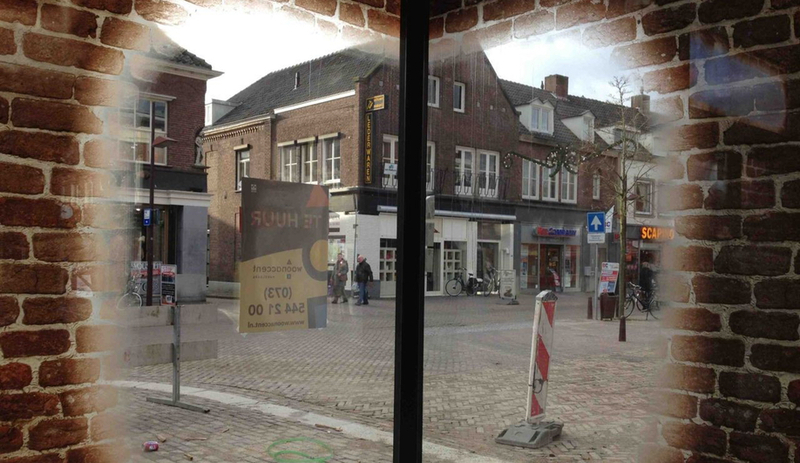 Instead it’s a photograph of one: MVRDV and artist Frank van der Salm took pictures of the existing farm architecture in the market square of Schijndel, the Netherlands – the hometown of Winy Maas and a place that was hit hard during World War II. 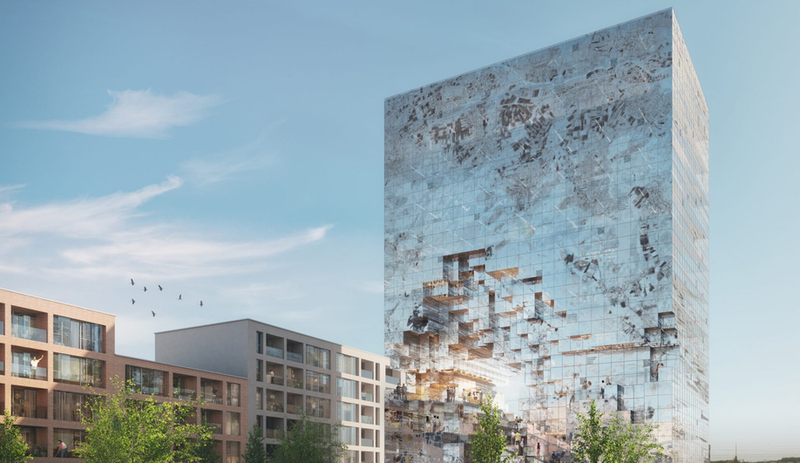 They then designed a typical farm building – but 1.6 times larger than any existing farm, and housing shops, restaurants and offices rather than animals – and printed this building-sized image onto the 1,800-square-metre glass wrap. In the changing sunlight, the image melds from solid to translucent, and some of the print is faded away in areas to provide direct views in. The project was completed in 2013, just 33 years after Maas first wrote the town council about his ideas for memorializing the area. Winy Maas’s participation at the AZ Awards Gala is made possible by the support of the Consulate General of the Netherlands in Toronto. The 2018 AZ Awards is presented by Cosentino, Keilhauer, Stone Tile and Laminam, and was sponsored by Flos, Landscape Forms, Urban Capital, and George Brown College School of Design. Gala sponsors were Alpi, DXV, Farrow&Ball, Scavolini, and Tas. The hotel sponsor is The Drake Hotel.